With the rise of the cloud, I have seen lots of small businesses building their technology strategy with a very little amount of local infrastructure. Similarly, I also see larger enterprises migrating to the cloud and trying to remove most of their local infrastructure. In Dynamics CRM/365 implementations, we often need to run recurring jobs that executes business logic (data integration or synchronization, complex calculated field etc.). This article talks about the different places where you can have these Dynamics 365/CRM connected jobs running periodically. If your business operates mostly in the cloud and you don’t have available servers to install and run you application(s), you can create a Virtual Machine in the cloud and deploy your executables on it (as long as your CRM/Dyn365 organizations and other integrated systems are accessible from the VM). Using SQL Server Integration Services (SSIS) Packages is pretty much identical to the Windows Executable approach. The difference is that you use SSIS, combined with a third-party tool for your CRUD operations with CRM/Dyn365 such as KingswaySoft, to contain your business logic and manipulate your systems data. You can then schedule SQL Jobs to run SSIS packages on a recurring basis. This technique is used when there is stronger knowledge on the SQL/SSIS side within an enterprise. Again, if you do not have a local infrastructure, you will have to create a Virtual Machine in the cloud with the required SQL Server components to create SQL Jobs and execute SSIS packages. While Dynamics CRM/365 does not have true task scheduler functionality, out of the box processes (workflows) can be used to achieve similar type of functionality. This is done by using the “Process Timeout” operation within a CRM Workflow. Check this article from PowerObjects on exactly how to setup recurring workflows in CRM 2016. It is not simple to reference libraries other than .NET and CRM libraries, fellow MVP Gonzalo Ruiz has a good article on how to achieve this here. If your custom business logic makes references to many external assemblies, it will be a bit more challenging to integration in a Custom Workflow activity (it’s a good idea to target web services instead). When your custom workflow activity as running is isolation mode or Sandboxed (this is always the case in cloud-base Dynamics CRM/365 Online tenants), there are limitations on what you can in the custom workflow activity (e.g. how to call external web applications, no IO operations, cannot access registry etc.). There is also a 2-minute timeout limit for any process running in Sandbox. If your business logic is long to execute (more than 2 minutes), this is not a viable option. Flow is relatively new to the Microsoft Cloud. It is a configurable workflow engine that allows to automated operations related to a large variety of cloud applications. The workflows have triggers that originate from cloud applications (e.g. email received from a specific sender, document created in OneDrive, or Contact created in Dynamics 365) or timer based. Flow offers a connector to Dynamics 365 in the cloud with a few trigger operations (record created, updated, deleted) and basic actions on Dynamics 365 such as creating, retrieving, updating or deleting a record or retrieving a list of records. This is a detailed article from Wayne Walton that perfectly summarized what Flow is and how it can be used, you can read it here. While Flows can run on a schedule (every x seconds, minutes, days, hours), there is a limit to the systems you can connect to from flow (last time I checked, there was integration built with just over 80 SaaS apps). If you want flow to execute custom business logic, you can develop and expose a Web API to the web and configure Flow to call it with contextual parameters. Custom operations can then be processed from within the Web API. The biggest advantage of using Flow is the ease of configuration. Power users with enough knowledge of Flow and Dynamics 365 can easily configure workflows. However, depending on the complexity of the operations that need to be executed, you might find yourself limited with the basic operations available. This could force you to write a custom Web API for additional processing. Overkill if you ask me, but there are situations in which this could make sense. Flow can only connect to Dynamics 365/CRM organization in the Microsoft Cloud. If you are running on-premises with IFD, it will not work. The License for flow is based on a number of runs per month (4500 with Plan 1 and 15000 with Plan 2). If you are not familiar with Azure Functions, you really should do that soon: “Azure Functions is a solution for easily running small pieces of code, or “functions,” in the cloud. You can write just the code you need for the problem at hand, without worrying about a whole application or the infrastructure to run it” (reference here). You can write functions in the development language of your choice (C#, F#, Node.js, PHP or Python) that connect to various external services or systems, including Dynamics 365. See this walkthrough if interested in knowing what’s involved. Azure Functions support events based on a configurable timer. What I particularly like about Azure Functions is that it is a pure serverless architecture to run custom code. If you had a small console application deployed as a scheduled task, you can easily bring your code into Azure Functions and do the same operations. If you are a company that does not want to deal with the overhead of having and maintaining servers internally to run your recurring processes, this is definitely the way to go. The billing calculation is complicated, but in short you only pay for the resources your code consumes when it runs. That means if you don’t run anything for a period of time, you have nothing to pay. Another positive about Azure Functions is that we can reference the CRM SDK which means should be able to connect to IFD-configured on premise installations (I haven’t tried this but I am pretty confident). One of the downside of using Azure Functions is the development experience. While this is changing, at the beginning you could only write your code in the Azure Functions code editor which makes you lose the magic of Visual Studio. Of course, these are a few existing options for recurring processes as it relates to Dynamics 365/CRM. Ultimately, the decision for each enterprise comes from its strategy, its people and its willingness to make investment. In my previous post, I shared some of the chanllenges we faced as part of the deployment of a full CRM Infrastructure in Azure. In this post, I will focus on how we exposed the CRM application on the internet to meet our business requirements. Before I talk about the options and our decision making process, it is important to talk about some of the key requirements that we have for our application. Customer information is also used/displayed in custom mobile applications (not the Dynamics CRM apps), available in the Apple Store and in Google’s Play Store. One of the design decision that was made is to have a web service that the mobile applications can communicate with. That way, all our mobile applications use the same Data Access Layer to get to and manipulate Dynamics CRM data. 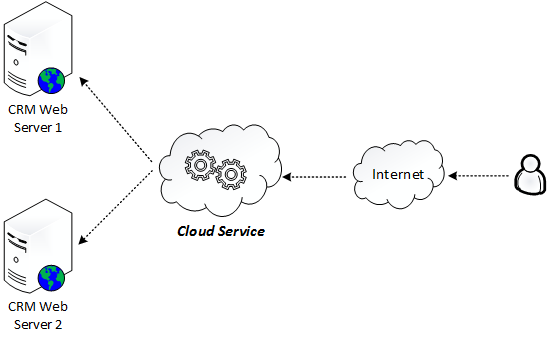 The following diagram shows a simplified version of our architecture. 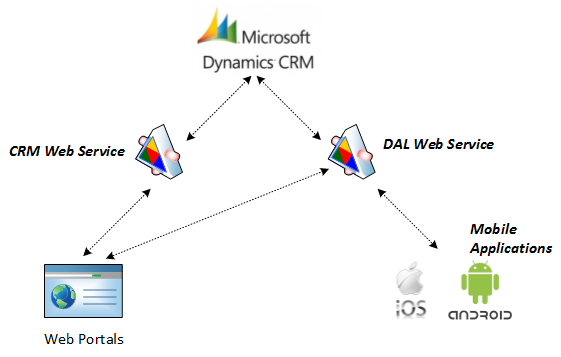 WIth that in mind, our portals and mobile applications have to be able to communicate with Dynamics CRM. To make that happen, we considered two options. That was our initial idea. We wanted to go with the classic IFD deployment for our Azure hosted Dynamics CRM installation. That would include the usual Claim-based authentication, ADFS configuration and a bit of advaned network configuration in the cloud service. In Azure, such a deployment isn’t very different from what we do for on premise-type installations. The main difference resides in how and where some of the configuration is done (certificates registration, DNS configuration done through Azure config using new portal or PowerShell commands). The other option here, is to simply use the Azure VM End Points and Load Balanced Sets features to expose the CRM application on the web (internal or public). The big picture consists of having the CRM front-end role installed on multiple servers in our cloud service, create a load balanced set that exposes the CRM Web sites through an accessible URL (can be public or internal depending on your setup and requirements). The challenges here are authentication and possibly security (and they are not discussed in detail here, but happy to elaborate questsions are posted!). Now we are getting to the cool part. We decided to go with the second option, mainly because of expertise, ease of support and ease of deployment. It is much easier to find people who have basic knowledge of endpoints, load-balanced web site, than people who know CRM and IFD. Untimately in our context, we needed to have a CRM that is accesible for our CRM users from anywhere in the world to our users. It also needed to be accesible from our Portals and custom web services all hosted in Azure. Important to keep in mind that if you want to use the Dynamics CRM Mobile applications, ADFS is the required authentication mecanism so that factor into your decision making process. Here are the main steps to getting to our goal. Looking at the Load Balanced Set above, we have created a web application available at “DNS Name” + Public Port. When the website at that URL is requested, it will be redirected to one of the CRM Virtual Machines on the port 80 which is the configuration you see with the VMs that are members of this Load Balanced Set. When you reach your CRM, you will be prompted by the browser for user credentials (AD). There are multiple ways to enable single sign on but not discussed here. One resource that has been key for us in the process of making this happen is the Cloud Ranger blog and videos! It’s been a fun experience. We love Azure more and more! To get more information and details on how you can build a full CRM infrastructure in Azure, or any information about your CRM needs and implementations, reach out to us! As part of a recent engagement, one of companies I work with made the decision to move from CRM Online to a CRM 2016 deployment in Azure. That includes full development and production environment virtual machines in Azure, and to take it even a step further, we need all of it to be internet facing (IFD) and connected to multiple Adxstudio portals. Sounds complicated enough? I thought I would share the main steps we went through, the reference (articles, resources) we used and some of the challenges we faced as well as the resolutions. This post will be broken into 2 parts. The first one, this one, focuses on how we set up the infrastructure. 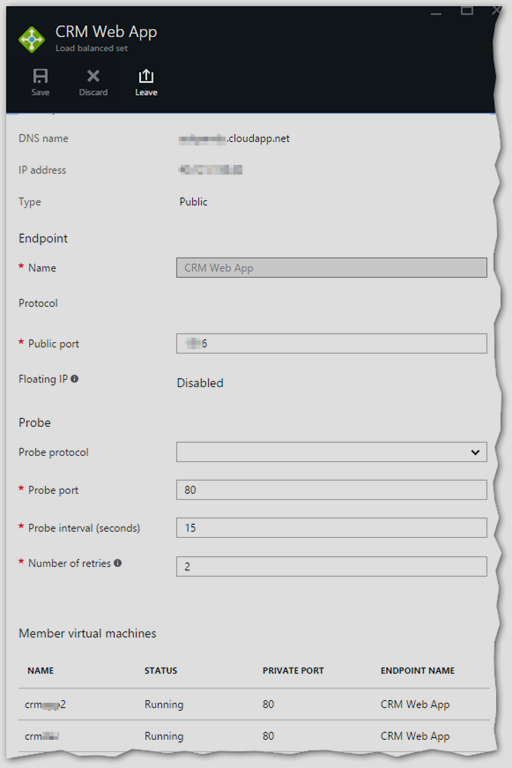 In part 2, I will describe the steps required to configure IFD for CRM in Azure. Time permitting, I write about how we tied in our Portals in the equation. In order to make this simple, I’ll discuss only our development environment. From an infrastructure standpoint, it is very standard. We planned to have two domain controllers (DCs), always good as a best practice in case one of the two isn’t available. 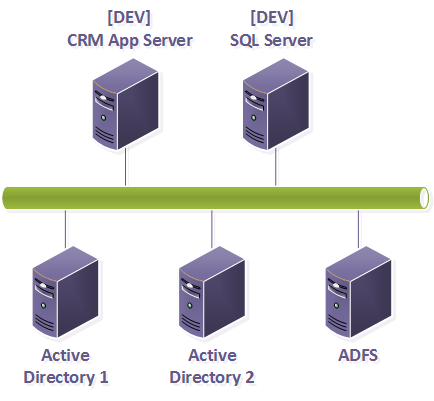 We also planned to have a separate ADFS server, one CRM Server with all roles, and one SQL Server. That all sounds simple enough. However, since we are working in Azure, there are a few things that are done a little bit differently than when you work within an on-premise environment. A step by step video of the process here. These resources are key to get you started. A few key important steps here are worth mentioning. Second, after the machines have all been created, we noticed there was no name resolution even through all the VMs were part of the same Virtual Network. We were able to ping using the IP address but not the machine names (short or FQDN, no difference). So we ended up taking a couple of steps to solve that problem. We manually added DNS entries for both our SQL and CRM VMs in our DNS Server. If you are not familiar with doing this, check out this well written article. Third, we initially had only one Domain controller for various reasons. We realized there was often long delays for AD related actions to be available throughout the network (e.g. add a user to an AD group). We created another server, joined it to our domain, added the AD DS role and made it another DC in our domain. Our issues seem to go away after we added an second DC. That’s it for now. Feel free to post questions if you have any!